An exciting new program for children will be starting this July at the Jackson County Farmers Market! Power of the Produce (POP) Club provides a fun opportunity for children to engage in the local food system through conversations directly with farmers, educational games and demonstrations, and exposure to new fruits and vegetables. 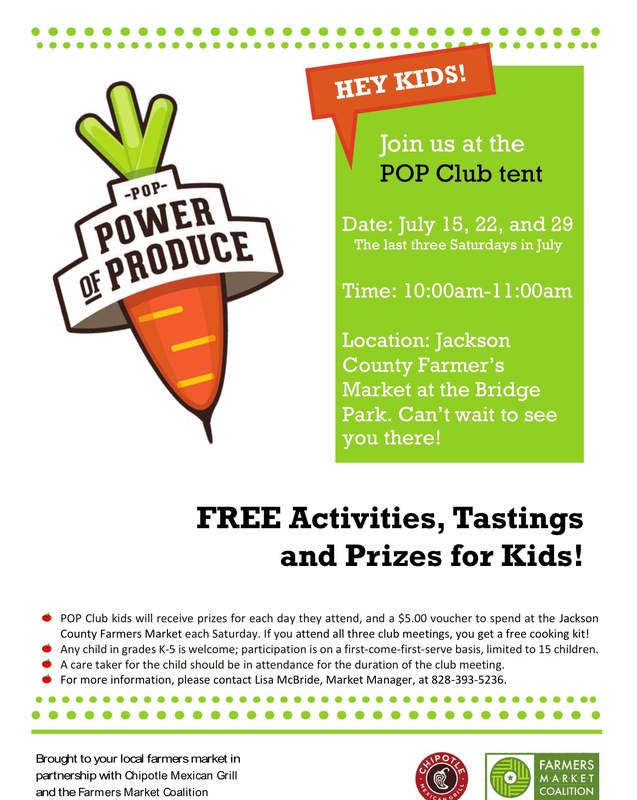 POP Club will meet at the downtown Jackson County Farmers Market the last three Saturdays in July (15th, 22nd, and 29th). The program will begin at 10:00AM and will last for no more than one hour. In addition to participating in fun educational activities such as food art and a scavenger hunt, POP Club kids will receive prizes for each day they attend, and a $5.00 voucher to spend at the Jackson County Farmers Market each Saturday that will allow them to make their own shopping decisions at the market. Any child in grades K-5 is welcome to attend. Participation each Saturday will be on a first-come-first-serve basis limited to 15 children and a care taker for the child has to be in attendance the whole time. This program is locally sponsored by: The Great Smokies Health Foundation, Harris Regional Hospital, Western Carolina University’s Dietetic Internship Program, The Jackson County Department of Public Health, Jackson County Farmers Market and the Healthy for Life action team of Healthy Carolinians.